The appearance at auction of a pair of paintings formerly attributed to Carlo Maratti and now attributed to Giuseppe Bartolomeo Chiari, which retain their original ‘Maratti’ frames, is an opportunity to examine the role and style of the Roman Picture Gallery Frame during the baroque period and to display a ’Frame Hang’ of ‘Salvator Rosa’ and ‘Carlo Maratti’ frames at Wiggins. The picture gallery in the 17th century Roman Baroque Palazzo had taken the place of the sala grande as the most important reception room. The furnishings and display of pictures were for the collector a means of aggrandisement, to display his refined taste, wealth and power. The French politician Charles De Brosses, on visiting the Borghese Palace in 1740, commented that ‘The sole decoration in the room consists of pictures’ and that ‘the four walls are covered from top to bottom in such profusion and with so little space between them’. In this crowded setting the role of the picture frame was not only, as Mancini put it, to act ‘as a window’ for the individual paintings but also, through a certain uniformity of design, to add symmetry and cohesion to the display, harmonising the visual appearance of the gallery. The Poussin Room, Palazzo Doria-Pamphilj, Rome. A flourishing market for pictures developed in 17th century Rome where paintings could be bought from merchants, artist’s homes and botteghe, which could be stocked with hundreds of paintings. Paintings were generally unframed although it was not unusual for picture dealers to stock ready made frames, which could cost more than the paintings. Life drawing academies, accademie del nudo, under the aegis of established artists, were promoted by leading families in the first half of the 17th century and by 1630 it was common practice to frame drawings. Bernardo De Dominici, a collector of graphic art, commented that by ‘placing them in frames’ drawings served ‘as ornaments for a whole room’. 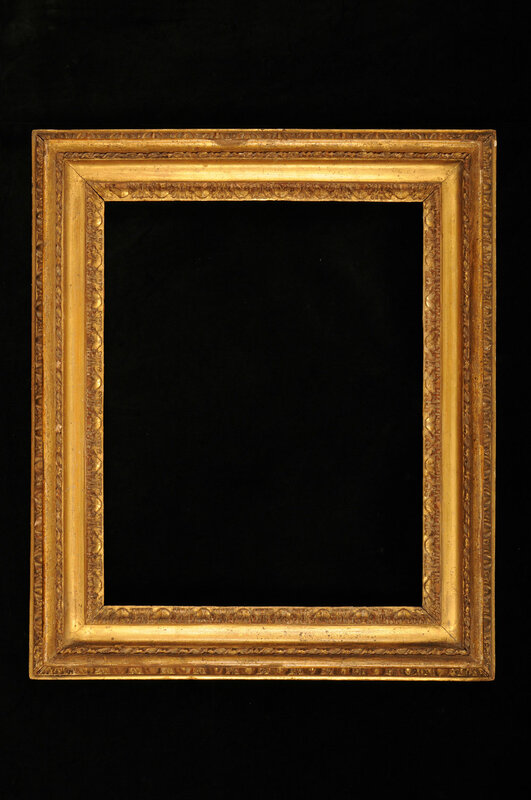 Italian, Rome, circa 1725, ‘Salvator Rosa’ frame for a drawing. Original glass and backboard from a set of 72. 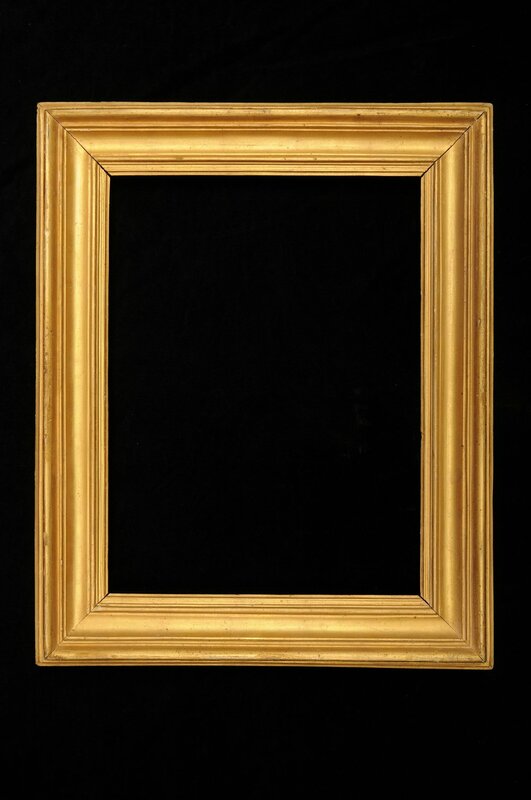 Artists saw the benefit of the frame adding value to their painting. Salvator Rosa stated that ‘the frame was a panderer to the painting’ and, according to Filippo Baldinucci and Bernardo De Dominici, art historians in the baroque period, he invented the frame style named after him. The style is sometimes referred to as a ‘Salvadoro’ or Salvadorino’ and is characterised by an ogee inner moulding, a cavetto and a raised knull. Italian, Rome, circa 1725, ‘Salvator Rosa’ frames. pin & ribbon twist and egg & dart back moulding. with applied, carved and gilded acanthus leaf ornament. The Maratti frame is ‘today used everywhere, lending much grace to a painting’ comments Giovanni Pietro Bellori, collector of drawings by leading artists of the period. He states that the artist Carlo Maratti ‘had introduced new models of black frames in pearwood, which imitate ebony, with exquisite gilded carving set against a fine dark background’. Bathsheba at the Bath; and The Angel appearing to Hagar in the Wilderness. Lot 33 Christies Old Masters Evening Sale, 7 December 2017, London. However, judging by correspondence from Richard Dalton in 1758, this was not the only pattern of frame referred to as ‘Maratti’. Dalton, the English draughtsman and art dealer, in Italy in the summer of 1758 to purchase paintings for the Prince of Wales, later King George III, and Sir Richard Grosvenor, wrote to the latter on the 16 September concerning the frames of ‘two very fine Maratti’s Ovals’ he was purchasing on his behalf. ‘The frames are good and truely C. Maratti frames, which are much the fashion in England. They are about seven inches broad. He made the designs of all the furniture of the House as well as the frames for the Prince of Palavacini at Rome’. These frames differ not only by being entirely gilded, but also in section, an ogee, which is profusely carved with acanthus leaf ornament. The ‘Bernini’ frame, also referred to as the ‘Cortona’ takes its name from the leading baroque sculptor and architect, Gian Lorenzo Bernini, who designed exceptional frames often incorporating family heraldic symbols. These frames were often carved by the gifted Pisan carver, ‘Il Pisano’, Antonio Chiccari. The ‘Bernini’ pattern is typified by the exceptional quality of three bands of applied carving, acanthus leaf and ribbon twist, as on the frame for Giovanni Battista Gaulli’s Portrait of Clemente IX, 1667, in Palazzo Chigi, Ariccia. Although here the ornament is laid on a section covered in red velvet to indicate the papal connection, it is more usually gilded. The frame is often enriched further with a cabochon knull and egg and dart ornament. Italian, Rome, circa 1725, ‘Bernini’ frames: Upper, husk, pearl, cabochon and acanthus leaf ornament. Lower- acanthus leaf, pin and ribbon, raking flute knull and egg & dart ornament. Frames were not only distinguished by their carved ornament but also by the inventiveness of the materials used and the decorative effect of the finish. Inventories often mention a ‘smooth frame’, without carving or ‘a mecca’, silvered and sealed with a yellow lacquer, an effect that was cheaper than gold. A frame of ‘purple ebony’ is recorded in the inventories of Lelio Orsini di Bracciano, in 1696 and ‘pear and olive’ wood, black ‘and gilded leaves’ and ‘black veined with white’ in the inventories of Flavio Orsini, Duke of Bracciano, in 1698. Although it would appear that the ‘Salvator Rosa’, ‘Maratti’ and ‘Bernini’ frame patterns were used on a wide variety of picture types by all schools of artists Giulio Mancini in Considerazioni sulla pittura (thoughts on painting), written between 1617 and 1621, suggested that a gilded frame was most suitable for an old or Caravaggesque painting and a dark frame for a painting with bright colours. Nevertheless, according to inventories, the gilded frame was most commonly found in Roman collections. Interestingly Giovanni Baglione’s Sacred and Profane Love, painted in 1602, is documented, whilst in the Giustiniani picture collection in Rome, as having a black frame in 1621, a frame that is ‘blackwith gold trim and arabesques’ in 1638, and in 1793 a ‘Modern Salvator Rosa frame gilded with good gold’. The picture frame is not only an important element of the decoration of the Roman Palazzo, but changed with frequency, is a fascinating document of the changing taste of the interior décor.